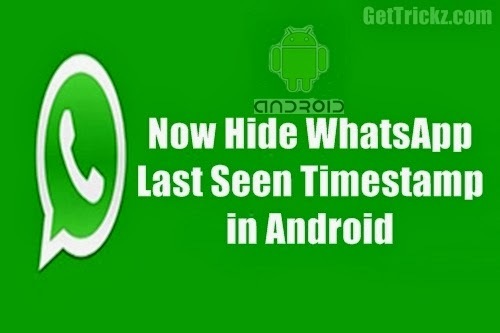 Whats app Now included the feature of timestamp ability to hide the "last seen at" in all android devices. 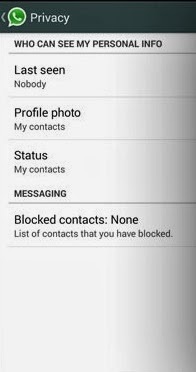 This feature was available only on WhatsApp for iPhone Users. Now you can use this privacy in android. Users can now choose if they want to display their last seen status to everyone, only to their contacts or to nobody. This feature launched after Facebook buy WhatsApp for $19 billion. Waiting for facebook to that how many changes the takes in Whats app. Two more features are added to whats app that you can ability to limit visibility of profile photos and status. Choose who can see your photo and status in whats app. This feature helping to Stop Leak photos of girls. The update that includes these features not available on Play store.If You want this feature you can directly Download it from whats app official site or Click Here. 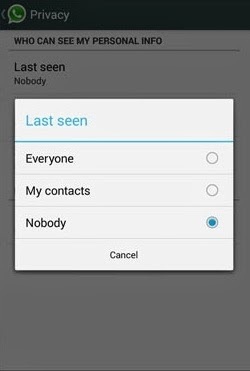 Note:If You Use Timestamp Feature in Whats app You also unable to see others last seen.